For the dumpling dipping sauce, combine ingredients and set aside. To make the dumpling filling, use a mortar and pestle to pound the garlic and peppercorns to a smooth paste. Place the paste into a large mixing bowl. Roughly chop 50g of the prawns and place those in the bowl also. Process the remaining prawns in a food processor until smooth. Add the prawn paste to the mixing bowl along with the pork, fish sauce, soy sauce, sesame oil, sugar, egg, cornstarch and spring onion. Mix vigorously until a smooth, sticky paste forms. 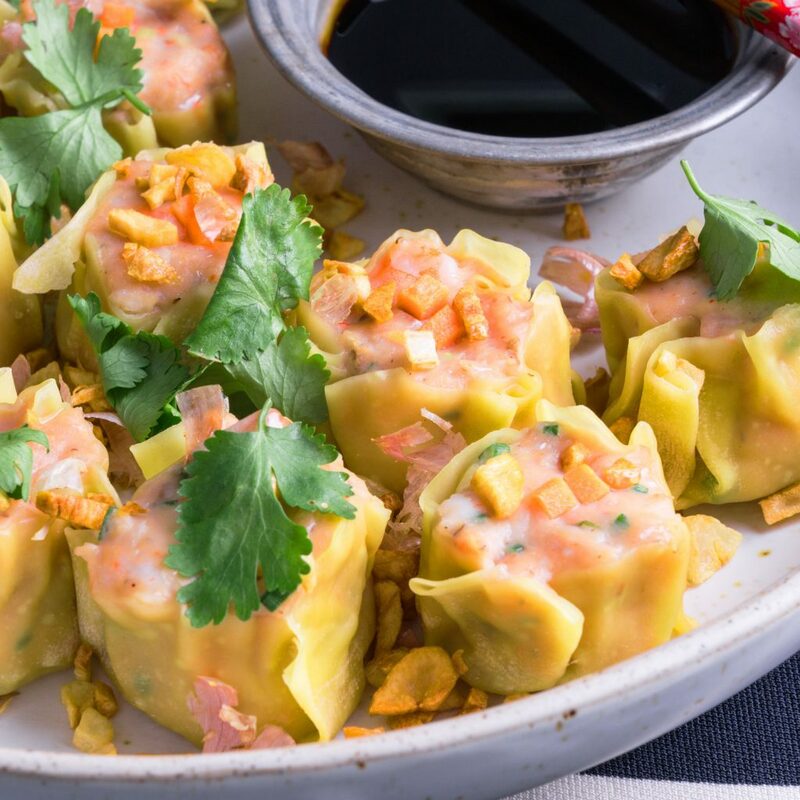 Cut the edges off the wonton wrappers. Make a fist with one of your hands and place a wonton wrapper on top. 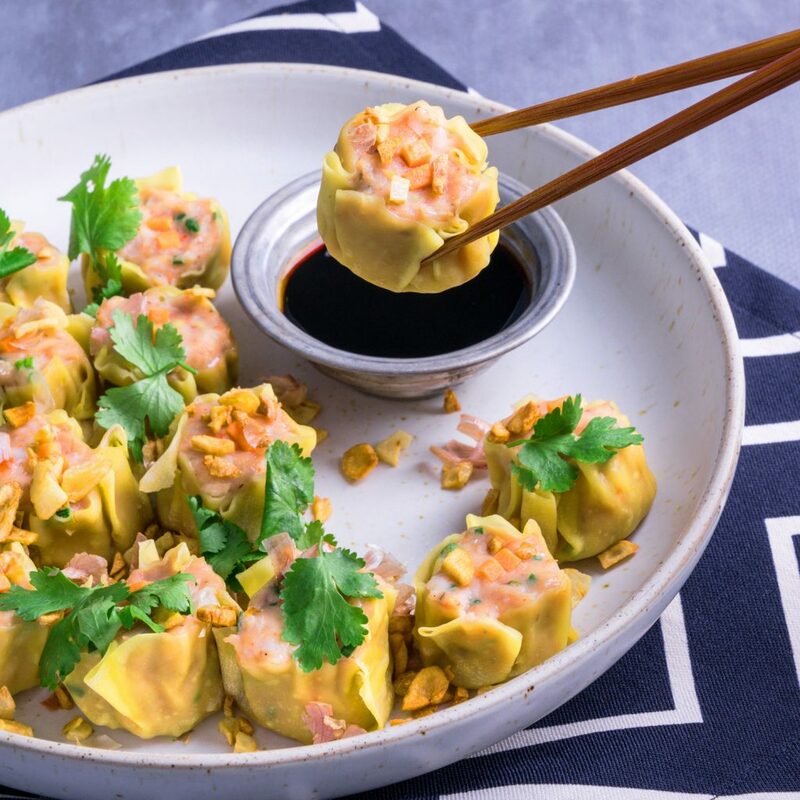 Place about a tablespoon of filling into the centre of the wrapper and use your fist to squeeze and form a pleated open-topped dumpling. Use your fingers dipped in a little water to smooth the tops. Top with a couple of cubes of carrot. Place in a steamer tray lined with baking paper. Alternatively, you can place these on a tray, cover with cling film and freeze until ready to cook. Steam for 20 minutes or until cooked through. Serve sprinkled with coriander and fried garlic and with the dumpling dipping sauce on the side. Crispy fried garlic is available in the Asian aisle at some major supermarkets or from Asian grocers. To make your own, simply roughly chop garlic cloves (leave the skins on) and fry them in hot oil until golden. Drain on paper towel and store in an airtight container.